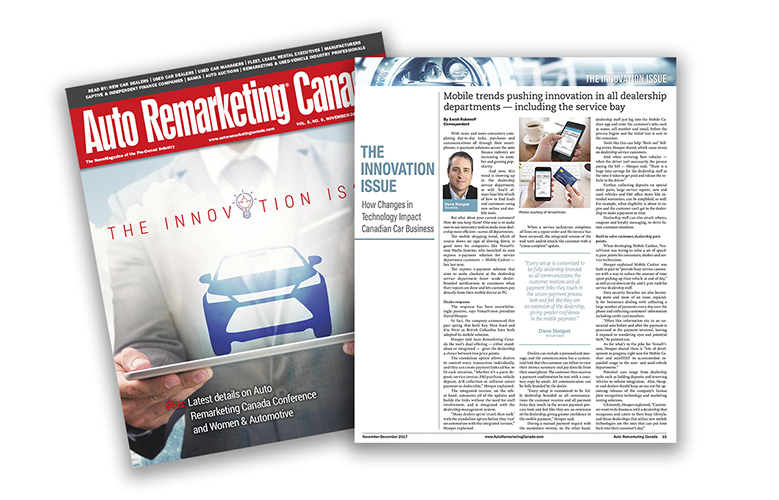 VenueVision is extremely honoured to have been featured as an Innovator in the automotive industry by Auto Remarketing Canada. Their most recent November/December 2017 edition, the ‘Innovation Issue’ showcases North American innovators. Our interview with author Sarah Rubenoff discusses how mobile trends are pushing innovation across all dealership departments. From Sales Departments to F&I to the Service Bay, technology is driving success rates. We discuss how VenueVision is developing some of today’s top technologies and innovations to help dealers stay ahead of the competition and provide the best customer experiences. Solutions like autoTEXT and Mobile Cashier allow dealerships and their staff members to communicate and conduct business easily and quickly with their customers. This in turn provides an increased level of customer service that ultimately puts time back into the customer’s hands. Read the full Innovation Issue article here.